This Christine Lagarde speech in Tokyo reinforces her formidable reputation for fluency. Fluency in law, finance, languages and politics. That fluency in language is something she shares with only a handful of international speakers. Among them, this President Putin English speech was, perhaps, less fluent. 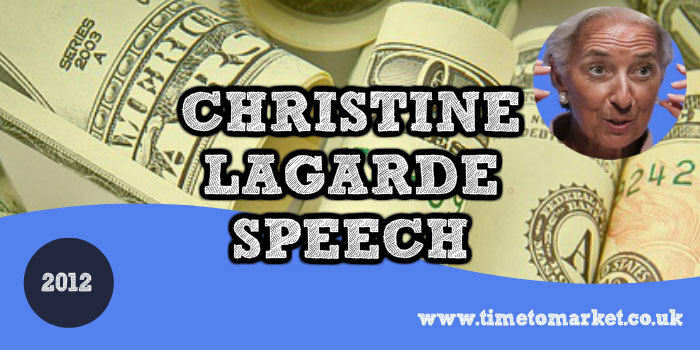 And, of course, Christine Lagarde is also no slouch when it comes to public speaking either. She began her speech with a very neat reference to the 60th anniversary of Japan’s membership of the IMF. And then, of course, she referred to the position 60 years later. It’s a favourite technique…and it worked. Journey? This speech has to be more important than an economics self-help group. She had some good structure to this speech. There were three main points that she referred to throughout and summed up in her conclusion. Faultless. With our tips, you can always discover more about how to manage your own presentation points. Let me begin with the issue of primary importance: the global economy’s ongoing effort to break free from the shackles of the financial crisis. It was refreshing for a finance speaker to use a metaphor beyond storm and tempest to describe the global economy. This stormy David Cameron speech was one such example. Even when faced with challenges at home, Japan has taken the global view, the noble view. For make no mistake: this is a global crisis. Policy co-ordination in practice, if you will. Of course she’s not the only financial supremo with a penchant for short sentences and lists. George Osborne speeches are strikingly similar in this regard. As Aristotle put it: “The whole is greater than the sum of its parts.” Today, more than ever, the world needs a vision of ‘the whole’. There might have been room for some Greek tragi-comedy or even siren voices. But the Head of the IMF is too serious a speaker for that. As well as restoring the health of sovereigns, we also need to restore the health of the financial sector: back to supporting, not destabilizing the economy; back to function, not dysfunction; back to service, not just profit. I will not go into the details here, but the IMF has laid out what we think needs to be done: better regulation, stronger supervision, and proper incentives for the private sector. Her speech proved well-structured and well-written. So, it contained enough to be serious and not too much to be tedious. That’s, of course, a difficult balance for an IMF speaker. You can discover a whole vault of public speaking tips prepared by us for our training courses, public speaking sessions and seminars. So, you should find something to help you with your next speech opportunity. But, when you are ready to take your public speaking skills to a new height, then please don’t hesitate to get in touch.